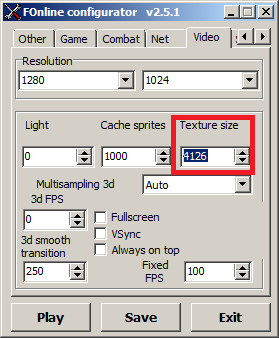 And I'm not even playing on very high screen resolution, it's only 1366x768, 1024 texture size. Cache sprites set to 300. Multisampling 3d is disabled. Is it normal that I got such low FPS in sandstorm? Even in normal conditions, I still doesn't have very high FPS, on 40% zoom. My FPS drops dramatically (to 2 - 5) everytime I see combat happening. Cirn0 has been made aware and says he is going to look into fixing this legitimate complaint. The whole thing is kind of confusing though. My set up is not by any means beefy, and is some years old. I still pull 100fps during a sandstorm with 0 drops. same for pvp, what have you. Id say it has less to do with your specs and more to do with where you live in connection/distance to the server, maybe? Have you tried using the other fonline exe? Well, other Fonline.exe doesn't work for me. Or when it works, I have stripes on screen... Only D3D one works, but runs poorly. Any suggestions about Game screen config? what videocard do you have? you didnt mention that and it's the most important part. I never had any issues with fonline and I can run all kinds of exes on all servers. I did however try to use one pc that was made for audio recording and only had onboard graphics, which was not able to run the "Normal" mapper which I believe is dx and had to run the d3d instead, so maybe it's an issue with non-desktop video cards. Nah, engine is a new, not from orginal Fallout 2D games. It's FOnline engine, not Fallout or FIFE engines. Ihmo user interface, combat modes and overall UX is better than orginal Fallouts. Old Fallouts can slow down when you browse player's equipment etc. Ihmo it seems to be much crude/lagged. Does it work with other fonline servers? Can you tell us more about this trick? How exactly can it help?